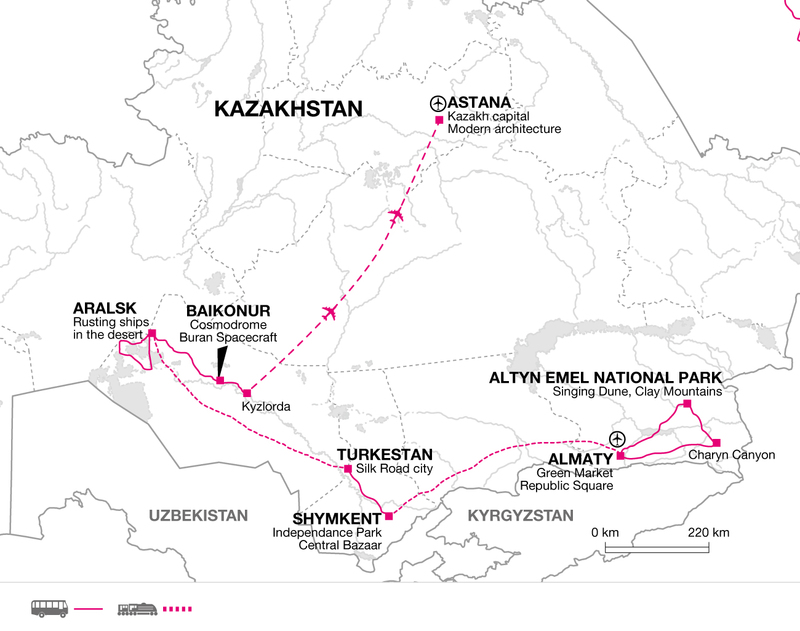 On this adventure through the largest and wealthiest of the 'Stans, we explore the leafy streets of Almaty, discover Silk Road history in Turkestan and uncover eerie rusting ships in the middle of the desert where the Aral Sea once was. We also visit the Cosmodrome at Baikonur where we learn about the Soviet and now Russian space programmes. The tour finishes in Kazakhstan's wealthy capital, where gleaming glass-fronted buildings unashamedly jostle for position to catch the eye. Baikonur - Visit the Baikonur Cosmodrome, explore a decommissioned spacecraft and sit in a cosmonaut's seat. Astana - Explore Kazakhstan's uber-modern capital with its glittering skyscrapers and bizarre architecture. Arrive in Almaty and check-in to the hotel, where the remainder of the day is at leisure. Almaty ceded capital status to Astana in 1997, but it still remains the cultural and financial centre, where Russians, nomadic Kazakhs, Kyrgyz, Tartars and many other ethnic groups rub shoulders in its bustling markets. 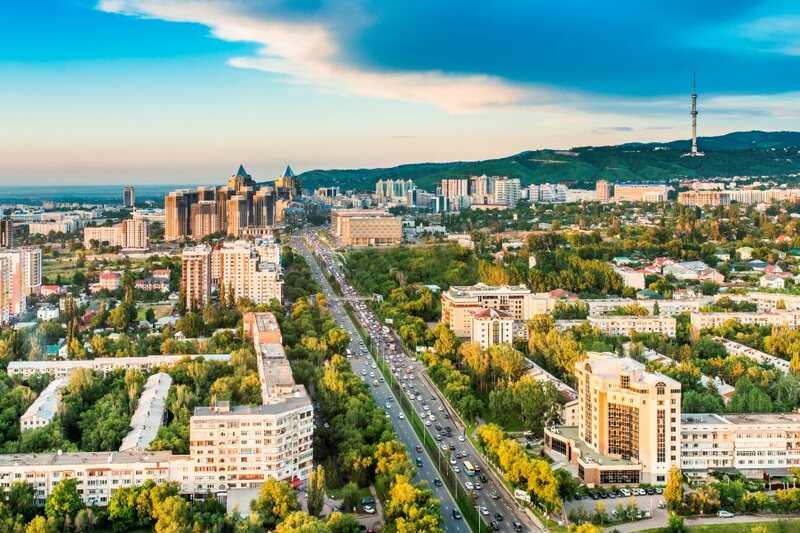 The city has a leafy, almost European feel, partly due to the earthquake in 1911 that flattened Almaty resulting in the complete re-planning and re-building of the city. Wide-leafy boulevards were constructed and lined with low-rise white-washed housing and offices, and the few period buildings that remained intact were restored to their former glory. The city enjoys an enviable position, nestled in the foothills of the Zailiysky Alatau mountains, with beautiful turquoise lakes, snow-capped mountains and chic ski resorts just a short drive away. Today we set out to explore some of the city's major sites, starting in the Park of 28 guards. The park is diverse, serving as popular meeting place for locals as well as housing a variety of important monuments and buildings. 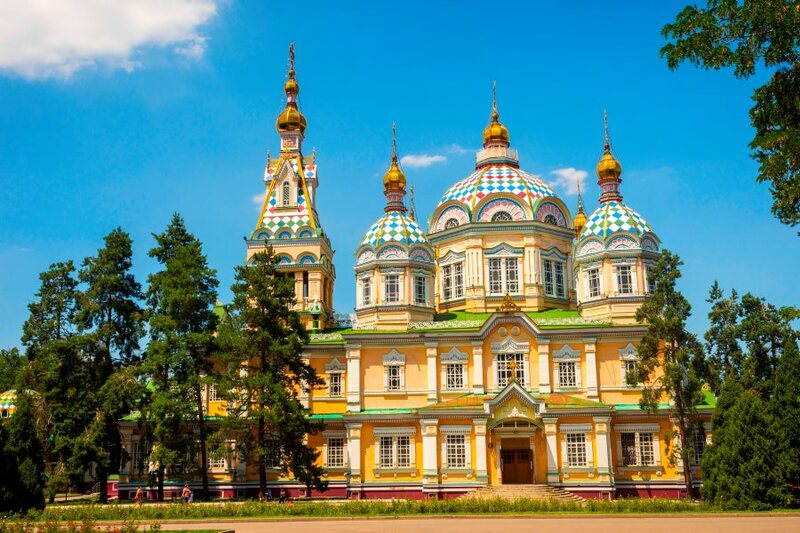 The park's focal point is the Ascension Cathedral, a beautiful Russian Orthodox style Cathedral and one of only two wooden buildings left in the city. Also found in the park are imposing Soviet statues remembering falling soldiers from campaigns such as WW2 and the Afghan War, where many Kazakh nationals fought to support the USSR's interests. We also visit the Museum of Musical Instruments, the other wooden-structure building that would look more at home in Switzerland than in Central Asia. It showcases a wide-variety of folk instruments that are both native to Kazakhstan, or were brought by travellers from throughout Central Asia and Persia. We then move onto Green Market, a fascinating meeting place for the city's locals to come for their daily shop. The market offers an eclectic range of produce brought by nomads as far flung as Korea, all the way through China and Central Asia. Here you can find exotic fruits, vegetables, an extensive butchery section with all types of meat and a wide variety of savoury foods. Make sure to try Kazzan (smoked horse sausage) and Kurt (salted cheese balls popular with beer). As we head out of Almaty this morning, the urban sprawl of the city limits quickly give way to wide open plains, our first experience of the vastness of the Kazakh Steppe. It's a pleasant drive that passes several lakes before the tarmac changes to gravel on the last 40 kilometre stretch to the national park. Our guesthouse is located in a small village on the fringes of park, offering a chance to sample a taste of a real Kazakh village life. This afternoon we set off for the Singing Dune. This huge 150 metre high sand dune is a geographical phenomenon, seemingly arbitrarily located in the middle of a rocky desert. Stranger still is the sound emitted from the sand when a combination of just the right conditions comes together - namely strong wind in the correct direction and a dry heat. It's not so much a singing but a low rumble similar to that of a jet engine, an eerie experience that is exacerbated by the deathly quiet desert environment that surrounds the dune. We plan to hike to the top of the dune, a walk of approximately 650 metres in length and a 150 metres ascent. It can be quite hard-going in the heat and the soft sand, but the panoramic views from the top make the hard work more than worth it. For those that want to, there is the option to return to the bottom via the tried and tested 'sitting down and sliding' method, which interestingly produces the same 'singing' sound! 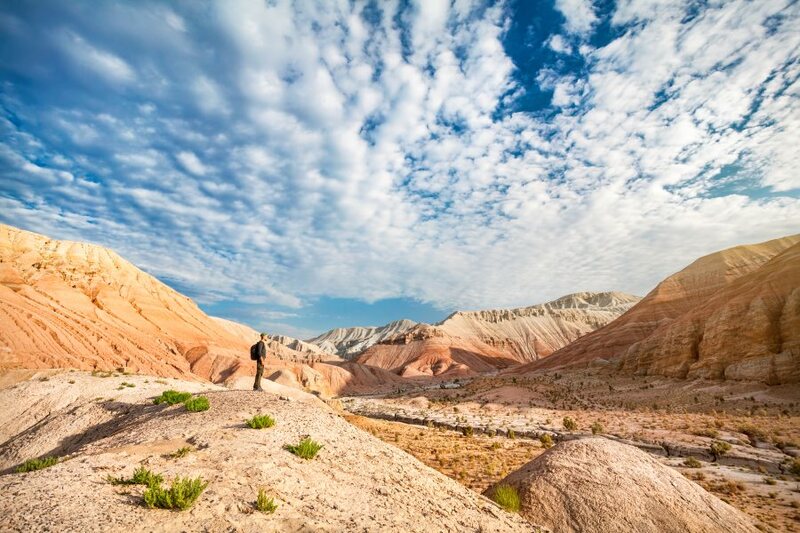 Today we have the full day to explore the huge and bizarre landscapes of Altyn Emel National Park. The park covers some 4,600 square kilometres of desert and rocky terrain, and as we make our way through the park it's not uncommon to see gazelles bounding across the expanse, and animals such as lynx, Tien Shen brown bear, polecat and stone martens are also present here, albeit more difficult to spot. We first plan to visit the mounds of Besshaty, an Iron Age sight that served as a ritual burial ground for important warriors from previous civilisations that passed through these lands. We next move onto the Aktau Mountains, a series of jagged mountains of striking beauty. Literally translated to 'White Mountains', the mountains appear a white hue from a distance, but as we get closer deep crimsons, bright yellows and vivid oranges become visible. We will take a short one hour walk into the mountains, following a dried-up riverbed that has cut its winding way through the terrain. We climb a small rise that affords us wonderful views of the surrounding mountains and ample photo opportunities. After a picnic lunch, we continue onto Katutau Volcanic mountains, a deep-red rock formation formed by ancient lava flows by a now-extinct volcano. We make our way back to our guest house in the late afternoon, where the rest of the day is at leisure. You may like to take a short walk around the vicinity for a chance to witness daily life in this sleepy Kazakh village. We set off for Charyn Canyon this morning, in the far-east of Kazakhstan and just a stone's throw from the Chinese border. After travelling across the wide open expanses of the Kazakh Steppe, the Canyon adds another dimension to the landscape, plunging to a depth of 100 metres and extending for 80 kilometres in length. We stop off at a view point perfect for photos of the canyon, before descending into the valley to walk along one of the deeper sections. After lunch we drive back to Almaty, where we make our way to the train station for our overnight train to Aksu Zhabagly. There is a restaurant cart onboard, however the food is fairly basic so the Tour Leader will ensure there will be a chance to buy snacks and drinks before we board the train. Our accommodation on the train will be in 2nd class sleeper - a private lockable cabin containing 2 lower and 2 upper beds, with toilets located at each end of the carriage. Bedding is provided, but you may wish to take a sleeping sheet for your own comfort. After some time to relax and unwind this morning, we set off to explore this ancient city. The city has been through several incarnations, first featuring as a centre-point on trade routes across Asia in the 5th Century, it then shot to prominence in the 12th Century when the revered poet and scholar Khoka Ahmad Yasavi set it up as a centre for learned scholars. As well as being a central city to Tamerlane's rule, it was also the capital of the Kazakh Khanate. Turkestan's stand-out monument is the 14th Century Mausoleum dedicated to the scholar Yasavi, which was commissioned by none other than Tamerlane himself. 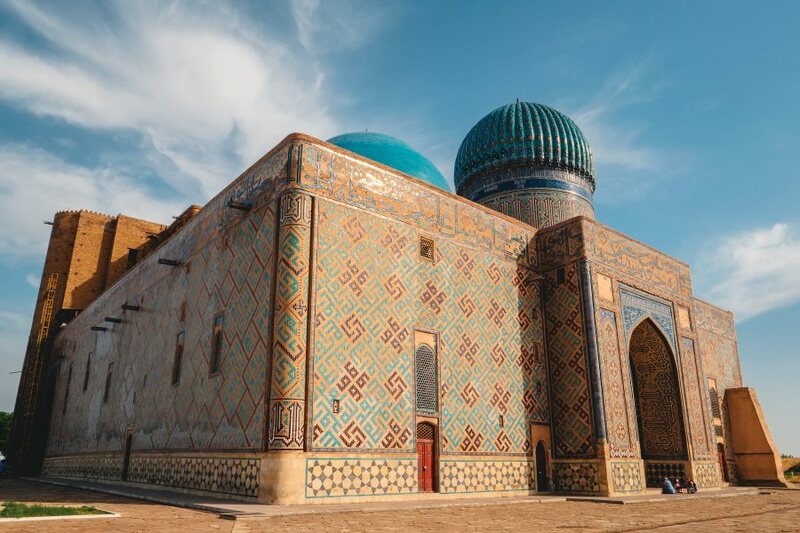 The turquoise-blue domes rival those of Samarkand and the building has been declared a UNESCO World Heritage Site. We spend time in and around this beautiful building this afternoon, as well as learning about the city's rich history when visiting the Hazrat Sultan complex and the mausoleum of the Kazakh Khan Esim. We rise early this morning to catch the train to Aralsk. The train ride takes us across the wide sweeping expanse of the Kazakh Steppe, and is a comfortable way to take in the huge landscapes that makes up much of this country. With few tourists in Kazakhstan, we expect to find ourselves causing a stir of interest among the locals, so we hope for some good opportunities today to engage with friendly Kazakhs with the help of our Tour Leader. Today will be a long day of travelling, anticipated to be around 13 hours so be sure to bring a book, perhaps some playing cards and plenty of snacks. There is a restaurant cart on the train, and the setup is a 'two seats facing two seats' type configuration, with a table in-between. Toilets are available at either end of the carriage. The train will make several stops along the journey where it possible to get out and stretch the legs. The train is scheduled to arrive into Aralsk in the early evening. The Aral Sea is one of the great geological disasters of modern times, losing an estimated 90% of its mass over a period of 40 years. In the 1960's Soviet engineers decided to divert the main rivers that fed the Aral Sea to irrigate nearby desert areas in a bid to encourage agriculture. In the years that followed the waters rapidly receded, many of the fish perished due to the increase of salinity of the water, and a once-thriving fishing industry died. At one point the Aral Sea provided one sixth of the fish eaten in the USSR, now all that remains are rusting shipwrecks stricken in the middle of a desert, and abandoned towns; a sobering reminder of the devastating impact humans can have when tampering with the powers of nature. We set off by 4WD today to explore Aralsk and its immediate surroundings. We first visit the Tsarist train station, complete with a poignant mural depicting Aralsk villagers providing fish for the people starving in Russia in 1921. The town has a small museum that provides further information on the disaster and charts the various efforts made to restore water to the area, efforts that are now, thankfully, starting to bear fruit. We then spend time driving over the former sea bed to see the stricken rusted ships that have been left out in the desert, along with other pieces of Soviet engineering that interrupt the otherwise-barren landscape. After a leisurely breakfast we make our way back to the train station for the four hour journey to the town of Baikonur. The town itself is very isolated, hundreds of kilometres in any direction from nearby towns it was a perfect location to build a secret USSR Cosmodrome in the height of the 'Space Race'. Nowadays the Russians effectively 'rent' Baikonur from the Kazakhs, a lease that lasts until 2050 and is worth $100 million dollars per year. Upon arrival we transfer to our hotel, a classic Soviet bloc type building that echoes its surroundings. It's clean and functional, but be prepared for it to bear all the hallmarks of the Soviet experience, both in service and comfort. This afternoon we set out to explore the town, starting with the Baikonur museum. It houses an extensive collection of all things space, documenting the city's conception, the construction of the cosmodrome and the rockets, the history of the space-race and how the Kazakh culture has influenced Baikonur. We move onto the lane of cosmonauts, a green park where a ceremonial tree is planted for each rocket launch and then onto the International Space School. This is the place where adventurous young children aged 10-15 are selected to learn about physics, maths, chemistry, and of course space! Founded in 1995 by the Kazakh government, the school was launched to capture young student's imagination about space travel and the science behind it, to try and ensure the legacy lives on with the next generation. Today we visit Baikonur Comsodrome, one of only two places on earth where humans are regularly thrust into outer space, and the sole launch site for manned missions to the International Space Station (ISS). Previously known as Leninsky and then 'Star City', Baikonur was selected in 1955 as the prime location for the USSR Space programme on account of its wide open steppe and lack of population under the rockets trajectories. Since then it has seen the launch of Sputnik (the first man-made satellite), Yuri Gagarin (the first man in space), Valentina Tereshkova (the first woman in space), and more recently British astronaut Tim Peake's mission to the ISS. After completing passport checks and formalities, obtaining our special permits and exchanging some Russian roubles, we effectively pass into Russian territory as we set out to explore the Cosmodrome and learn about the fascinating history that has been made here. We visit the house of Yuri Gagarin before continuing onto the Space Museum which details the history of the Soviet and now Russian space programmes. One of the highlights of Baikonur is a visit to the decommissioned Buran spacecraft where we can explore the interior and complete a childhood dream for many - having the chance to sit in a cosmonaut's seat. There is some free time this morning before we leave Baikonur and drive the three hours on well-laid roads (thanks to the Cosmodrome and the Western Europe to Western China project) to Kyzlorda Airport. We then take the short flight to Astana, and after checking into our hotel, the evening is free to explore this modern and vibrant capital. In 1997 Kazakhstan's President, Nursultan Nazarbayev took the bold decision to move the nation's capital from the charming tree-lined city of Almaty to the wide wind-swept expanses of the northern steppe. Citing Almaty as having a lack of space for expansion, the capital moved to the site nearby a former gulag and has since been transformed into one of the world's most modern and fastest-growing cities. With the help of British architects Astana's skyline is now peppered with unique buildings and skyscrapers, and is still expanding by the year. The centre-point of the city and the capital's show piece is the Bayterek Tower, a 100 metre high monument of white latticework topped off with a large golden orb. We visit the tower and take the lift to the top to learn about the symbolism behind the architecture and enjoy extensive views of the city. We also visit the Nur Astana Mosque, an incredible white and gold structure with space for some 5,000 worshippers, and the National Museum with its blue-glass and white-marble cubist structure that showcases a huge array of Kazakh history from Bronze Age to modern day. The rest of the afternoon is free to either relax or to further explore this beguiling city. Day 13: Morning visit to Alzhir gulag. Free afternoon in Astana. This morning we make the one hour drive out of the city to the Alzhir concentration camp. When translated from Russian, Alzhir stands for 'Akmolinskiy internment camp for the wives of the betrayers of the homeland', and as the name suggests it served as the main gulag for the wives (and sometimes children) of political prisoners that had been deemed traitors of the Soviet Union. Often no crimes had been committed by the spouses, they were found guilty purely through association. The camp was active between the 1930's and 1950's, forcing women to perform various labour tasks such as sewing, agriculture and construction work under harsh conditions and on meagre food rations. Life was particularly harsh through the brutal winters, with limited protection offered against the bitter cold experienced in winter time on the steppe. 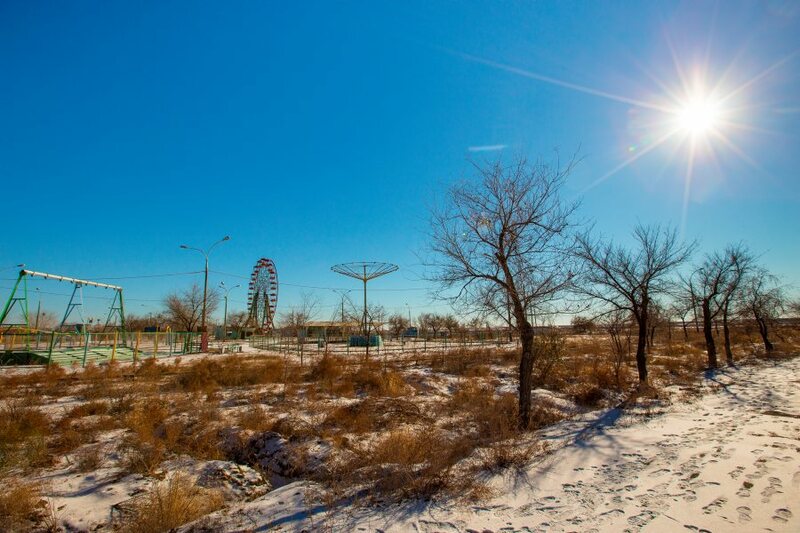 Modern-day Kazakhstan has done a good job of bringing these atrocities to light, with the camp now acting as a memorial and museum, documenting what life was like during its operation. After a guided tour of the memorial we head back to the city, where the rest of the afternoon has been left free for some last-minute souvenir shopping, or further exploration of Kazakhstan's capital and its mind-bending architecture. The trip ends in Astana this morning after breakfast.